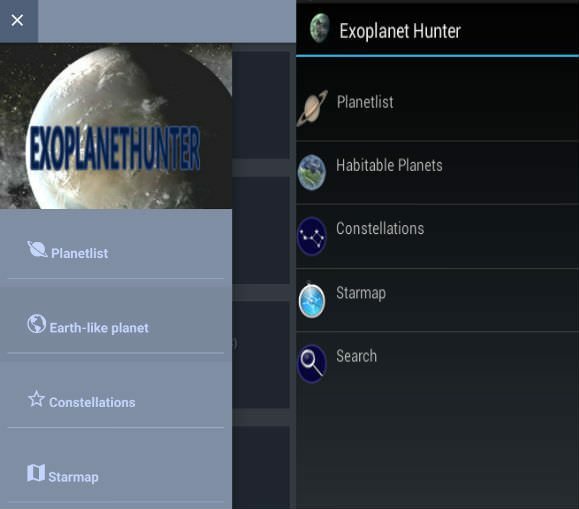 A new version of the Android application Exoplanet Hunter has been released. The android application has been ported to the framework React Native developed by facebook. The app is available in two languishes English and Swedish. 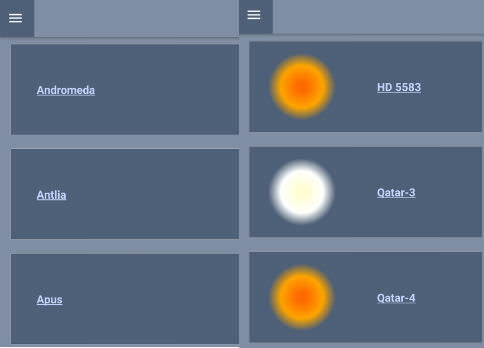 Compered to the old version the user interface has been improved. 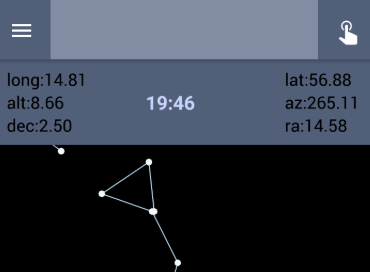 The app has four sections Planet list shows all planets ordered by last discovered date. Notice that the old search feature is not gone. If you click the settings gear in the upper right corner you will find two options. 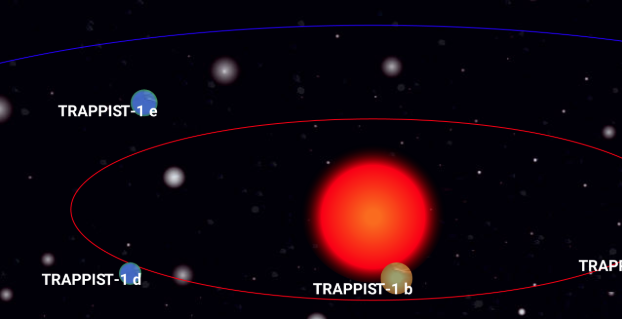 Planet habitable zone classification (hot, warm, or cold). The gear will be red marked if a selection is active and is white marked if it is cleared. 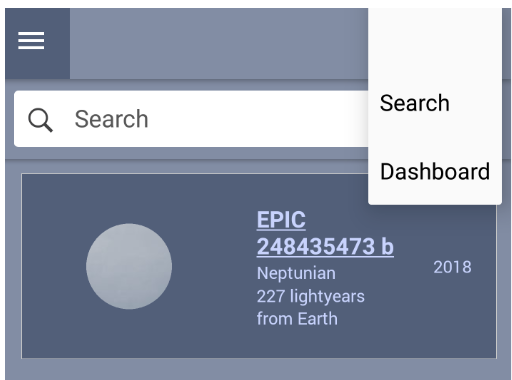 The Dashboard will contain information number of discovered Exoplanets and number of habitable planets. More detailed statistics regarding exoplanets in this section is planned for in future releases. If you select a planet in the list you will go to an information page about the planet. Notice this text is autogenerated and automaticity fetched from the PHL database. We never manually look for this information online and write about exoplanets. This is generated using SVG and this is a feature that also is planned for the website in the future. 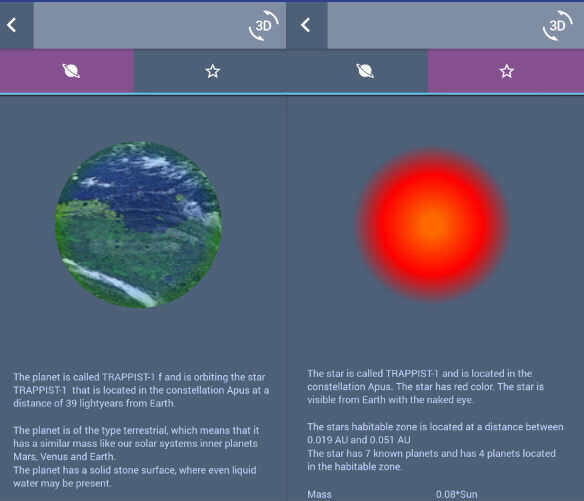 The system is zoomable and the planets are clickable and will take you to the information page for the planet that is clicked. The red line and blue line marks the beginning and the end of the stars habitable zone where alien life could exist. The section earth-like planets will take you to categories for different habitable zones. Planet Earth Similarity Index (ESI) is used for identify possible habitable planets (ESI > 0.7). 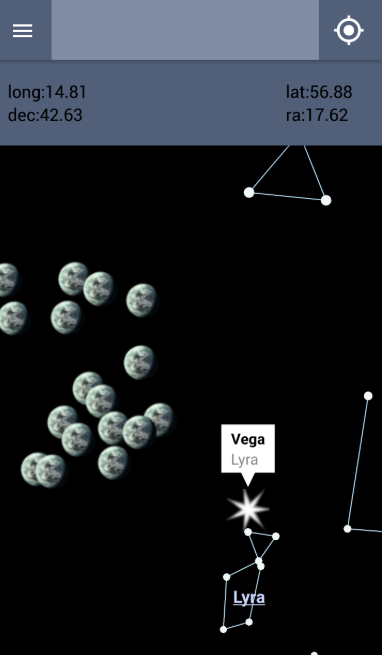 The constellation page will list all constellations and the solar systems in each constellation clicking on the star will take you to the simulation of that system. The last section will be the starmap. On map initiation will begin at declination 37.87 degree and right ascension 18 hours in the search range area of the Kepler telescope between the constellations Lyra, Cygnus and Drago. 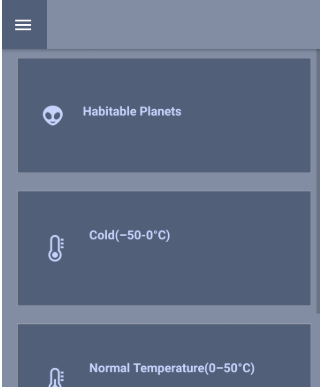 Potential habitable exoplanets will be shown on the map and will be clickable and take the user to the solar system simulation. The map will be draggable at initiation. By clicking the gps icon at the right corner will activate the phones sensors. Accelerometer and magnetometer will be used to pinpoint the location of the planet from the phones orientation using the altitude and azimuth angle of the device. The time shown in the clock will be the time reckoned from the motion of the earth relative to the distant stars. This is called the sidereal time. This version is still beta and i can be downloaded at google play. Service will be found under the section api and will replace the old not updated service.